How should Iran’s intentions in Syria be understood? The question is all the more relevant in light of the recent exchange of missile fire on the border between the Israeli-occupied Golan Heights and Syria. Writing in The Intercept back in March 2018, Robert Wright argued that DC think-tanks “warp our vision” and prevent us from applying “cognitive empathy” when it comes to Iranian intentions in Syria in particular. By “cognitive empathy,” Wright means understanding how a particular side thinks about a situation and why it acts in certain ways in that situation. Through this lens, Wright argues that Iran’s intentions in Syria should primarily be understood as embodying objectives of defence and deterrence: intervening to save a key ally (the Syrian government) and deterring the threat of attacks by the U.S. and Israel against Iran. There is some truth to Wright’s framing of Iranian intentions, and “cognitive empathy” is no doubt an important thing to remember in analysis. However, I believe his piece assumes too much of a false dichotomy: either Iran’s intentions are primarily defensive or offensive/expansionist in nature. In reality, it can be simultaneously true that Iran has a policy of “forward defence” in Syria (as Vali Nasr puts it) and wishes to increase its influence in Syria and the wider region in comparison with the pre-2011 status-quo for a variety of reasons that are not merely matters of defence and deterrence. Here, I will explore in more detail some key controversies regarding Iran’s presence in Syria and how they relate to questions of Iranian intentions in the country. Unsurprisingly, the campaigns launched against the Islamic State in eastern Syria last year involved a competition for grabbing territory in Deir az-Zor province, with the Syrian Democratic Forces and the United States on one side and the Syrian government and its Iranian and Russian allies on the other. I would caution against viewing a land route for Iran as the main motivation for the offensive on the part of the Syrian government and its allies. The Syrian government had its own very compelling reasons to go on the offensive: seeking to reclaim oil and gas resources and re-open a land trade route with Iraq in a bid to boost its economy and reduce dependence on aid from its allies. Further, the air routes Iran utilises are well-established and reliable. After all, there is no U.S.-imposed no-fly zone over all of Iraq and Syria. Technically speaking, a land route for Iran did exist for a brief window in the first months of 2012 following the U.S. withdrawal from Iraq, though it was not used. 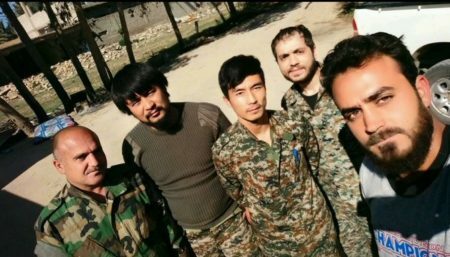 Members of Liwa al-Mukhtar al-Thiqfi (Idlib Local Defence Forces affiliate) with Afghan fighters in al-Mayadeen, eastern Deir az-Zor province. These data points do not mean that there is no role for the Syrian army in security in the border areas. For example, Syrian army general Hassan Muhammad is both chief of staff of the Syrian army’s Third Legion (III Corps) and head of the Syrian government’s security committee in Albukamal. Part of his role entails security inspections along the border. Yet the concentration of Iranian forces and their clients in the area is highly unlikely to be a coincidence and points to an interest in a land route. Demography: One way this argument runs is that there is an Iranian-backed/directed plan to depopulate large parts of Syria (e.g. the border areas with Lebanon) and replace the displaced Sunnis with foreign Shi’i settlers and their families. The supposed intentions behind this alleged plan are to ensure that these areas do not become future epicentres of revolt, to alter the nature of Syria’s demographic makeup (i.e. rendering it far more Shi’i and ideologically aligned with Iran) and to create a stable land-route running from Iran to the Mediterranean and populated with Shi’a loyal to Iran. Little evidence has emerged to support claims of an Iranian plan along these lines. Demographic engineering on such a scale would be a very difficult task to accomplish. There is also little prospect for Iran to transform Syria into an Islamic republic. Meanwhile, displacements in many places are explained more readily in terms of the Syrian government’s own thinking (e.g. the Alawite-Sunni sectarian dynamic in Homs city and the desire for insurgent elements and their supporters in proximity to the capital to be removed). 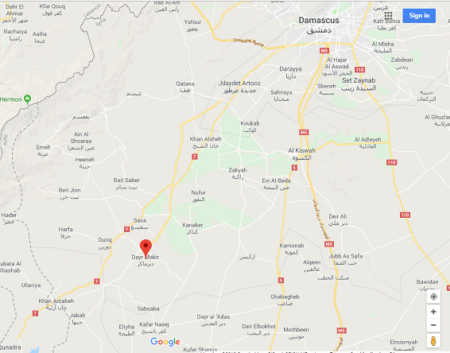 Nonetheless, in a few areas- most notably the “Triangle of Death” area at the intersection of Damascus countryside, Quneitra and Deraa governorates- bases for Iranian client forces (clearly intended for long-term military purposes) have been established at the expense of displaced locals. For instance, the village of Deir Maker in that area is virtually devoid of all of its original inhabitants as it has become a base for Hezbollah, according to a rebel originally from Deir Maker who fought in Beit Jann, as well as sources in the nearby town of Kanaker to the northeast, which agreed to a “reconciliation” at the end of 2016. Deir Maker and the wider area. The outlet al-Modon touched on this matter in a report in May 2017, claiming that Hezbollah’s official in the “Triangle of Death” area- al-Hajj Abu Abdullah- had given orders to allow for Syrian Hezbollah fighters to bring their families to the area and settle there. The outlet claimed that more than 70 families of Syrian Hezbollah fighters had arrived to settle in the localities of Deir Maker and Sultana. The outlet added that the families of these Syrian Hezbollah fighters had come from al-Fu’a and Kafariya (the two besieged Shi’i villages in Idlib province) and the al-Wafideen camp (Sunni Palestinian-Syrian refugee camp northeast of Douma). The report says that in contrast, the displaced original inhabitants of the “Triangle of Death” area had tried petitioning the Syrian military intelligence branch in Sa’sa’ to return to their villages but without success. 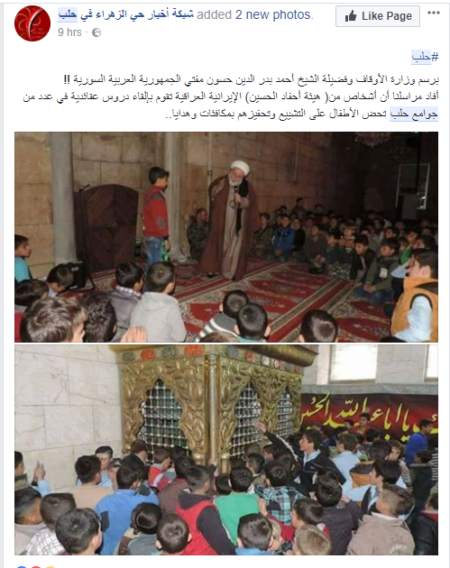 Another issue that relates to Iranian intentions in Syria and partly touches on demography is the matter of encouraging conversions to Shi’i Islam. Iran, after all, is a state that engages in proselytism for Shi’i Islam, so it is logical to expect that Iran would exploit opportunities to promote the faith. Indeed, Iranian proselytism was already active on the ground in Syria before the civil war, despite downplaying of the phenomenon by some foreign observers back then. In some places of course, such as the primarily Druze province of al-Suwayda’, proselytising proves too controversial to make any meaningful headway, and there are non-Shi’a who join Syrian Hezbollah groups with no intention of converting to Shi’i Islam. Arguably, the most prominent armed group linked to the phenomenon of conversion to Shi’i Islam is Liwa al-Baqir, which plays on the link between Bekara tribesmen and the fifth Shi’i imam Muhammad al-Baqir. Conversions of some Bekara tribesmen had already been occurring before the war in Aleppo province in particular, but Liwa al-Baqir’s ascendancy is undoubtedly continuing that trend and encouraging conversions beyond the group’s original recruitment base. “Q: Sayyid, there is the front of the south of Syria and many have spoken about it and it is a source of great concern with the Israelis: that Hezbollah and Iran, with the aid and support of the Syrian army that has also fought for seven years, are preparing a resistance on the borders from the Golan to the southern borders in their entirety. Is it true that there is a new resistance on the Syrian-Palestinian borders against Israel? A: This is also among the matters about which it is better to be silent on in the end. Q: This is a silent interview, Sayyid. A: You are the one going to difficult questions. The enemy has the right to be worried, because what has happened in the south of Syria in the end is experience that has been made available now among the Syrian people and the Syrian army as a regular army. You know that those who fight in Syria are not only the army: those they call the auxiliary forces in the Syrian media. There are popular Syrian formations: youth from the sons of different villages, towns and regions, they have fought in their provinces. There is great advanced experience that these youth have obtained especially on the southern front because the fighting in the southern front has sometimes taken the classical form and sometimes the form of guerrilla warfare from the two sides. Practically this has given rise to a manpower structure on the level of thought, experience and preparedness that can be brought together perhaps during 24 hours. It is not conditional on the existence or lack of existence of a real formation. Our very presence in southern Syria, whose circumstances have been connected with the nature of the current battle in Syria: the fact we are present, it is natural that the Israelis should be worried, because there is conflict between us and the Israelis. Thus we see the Israelis are worried about all that is happening in the south of Syria. And they are working, applying pressure and trying to benefit from American pressure and speaking with Russia. And they are trying to threaten that there should be no resistance or resisting presence in southern Syria, but they have not realised this until now. Q: I understand from your words Sayyid that resistance cells prepared for any future war with Israel have arisen there? A: The resistance is present in southern Syria, and in all circumstances, regardless of the defensive title, this is very natural because it is Syria’s right that this should be present for it in the event of aggression against it one day and it has the right if one day it takes the decision to resort to the popular resistance in liberating the Golan. And if you remember in the last years before the beginning of the events in Syria, President Bashar al-Assad referred to this matter and also stated that it is possible for us one day to arrive at this choice. It is a logical and natural choice, and Israel deeply fears it. Q: President al-Assad was speaking about a popular Syrian resistance. Now, according to what I understand from you sir, there is a popular Syrian and non-Syrian resistance present in the southern front? Is the intent here to build up a “resistance” front and start a “liberation” war against Israel, or is it really just about deterring Israel from attacking as “no side wants war”? The answer lies somewhere in between. There is probably no wish for an all-out war on any side, but the constant rhetoric of “resistance” and fighting Israel demands some form of realisation on the ground in order to maintain credibility: that is, building up a “resistance” front in proximity to the border areas with a view to harassing Israeli forces through occasional small-scale probing. In conclusion, there are grounds for understanding some of Iran’s policies in Syria in terms of pragmatism and rational interests, but there is also a clear element of ideology behind some of its actions, and those actions cannot be understood only in terms of defence and deterrence. Otherwise, one risks becoming an apologist for Iranian policies that are problematic in many ways, such as the aggravation of wider sectarian tensions in the region. You are giving sectarian struggle too much “credit” and offer no references to back up your claims. Your assertion that Iran has active plans to destroy Israel by 2025 sounds like FUD designed to increase animosity between belligerents who are already on the brink of engaging in a regional war. The Iranian regime and its opponents have all expressed provocative sectarian sentiments and, as the article points out, these are not always idle words. But taking the most grandiose statements at face value and ignoring the context in which they are made is foolish, at best. Rhetoric and action are two different things, and the former does not always lead to the latter. Religious propaganda is a tool used by oppressive and corrupt regimes and that includes Iran, Saudi Arabia and Israel (which uses oppression against Palestinians). This propaganda helps militants and attract uneducated and poor young men who are typically the fuel of any selective war. The fight is not about religion, it is about water, money and influence, religion is just a tool. Most young Iranians want jobs and a good life, destroying Israel is not high on their agenda. Israel can only thrive and survive in an environment of conflict and the Zionist propaganda as old and boring as it is can serve as a cover to hide occupation and human right abuses and a way to play the victim even is that imaginary victim is an occupier with nuclear weapons and a strong economy. No one can define what are Iran’s interests in Syria/Iraq/Lebanon without bringing into discussion the history of Shi’a in Syria/Iraq/Lebanon.